Outstanding! Articulate, clear and concise, always fascinating. Preet and guests help me understand what's happening and how to interpret the insanity in our country. THANK YOU. 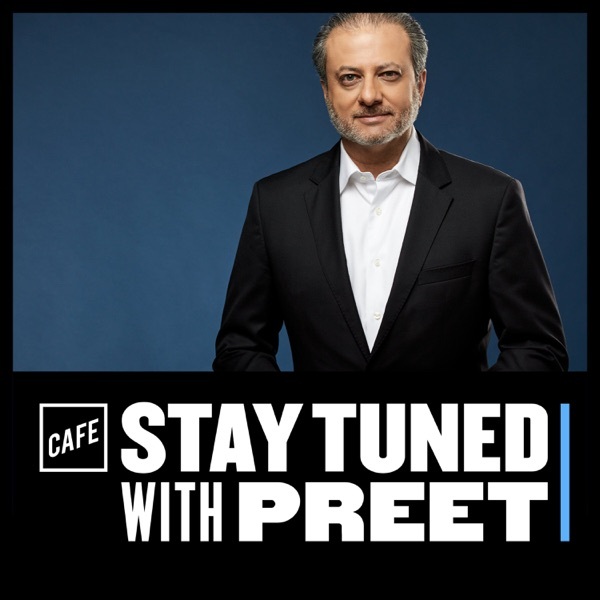 Preet and his guest, Anne Milgram, the former New Jersey Attorney General and co-host of the CAFE Insider podcast, analyze the newly released Mueller report. Preet previews what he’s looking for in the Mueller Report and answers listener questions on the topic as the Stay Tuned team gears up for our special episode: The Mueller Report, featuring Anne Milgram. Coming later today (tomorrow morning at the latest). Also, today is the last day for you to vote for Stay Tuned for best individual episode of a podcast: Bill Browder. In this clip from the CAFE Insider podcast, Preet and Anne discuss Wikileaks founder Julian Assange's indictment. Like the Q&A at the top of Stay Tuned? Check out CAFE Insider, which includes a weekly podcast from Preet and his co-host Anne Milgram on the latest news at the intersection of law and politics. In this clip from the CAFE Insider podcast, Preet and Anne discuss the political and legal questions raised by House Committee on Ways and Means Chairman Richard Neal's letter to the IRS requesting six years of President Trump's tax returns. In this clip from CAFE Insider, Preet and his co-host Anne Milgram discuss Mueller's approach to the report and whether Barr will invoke executive privilege. - Bureau of Justice Statistics 2016 report on Mortality in Local Jails, 2000-2014. PBS Newshour, 3/20/19: Watch Preet's interview with Judy Woodruff on PBS Newshour. Pete Buttigieg is the Mayor of South Bend, Indiana, and a possible candidate for president in 2020. A Rhodes Scholar and U.S. Navy Reserve veteran, Buttigieg was elected at age of 29. He’s the author of a new book, Shortest Way Home: One Mayor’s Challenge and a Model for America’s Future. Frank Bruni’s 2016 op-ed, The First Gay President? Christiane Amanpour is an award-winning journalist and Chief International Correspondent for CNN. She is also the host of Amanpour & Company, a CNN, PBS and WNET collaboration that features conversations with leaders and influencers across the globe. An article in the Washington Post on the origin of the National Emergencies Act and its previous uses. President Reagan’s remarks at the Ceremony for the Medal of Freedom (1/19/89), and transcript. Amanpour’s show, Amanpour & Co.
Preet’s tweet about pleaded v. pled; and see Mueller’s sentencing submission for Manafort, where prosecutors write “pled,” NOT pleaded. Michael Horowitz’s inspector general report. The interview was taped on 2/5/19. The non-prosecution agreement between American Media, Inc. (AMI) and SDNY. An article in The Daily Beast reporting that Michael Sanchez, the brother of Bezos’ mistress, is the leaker. A report from NBC News on Senator Burr’s comments concerning the possibility of collusion between Trump campaign and Russia, plus Senator Warner’s dispute. An article in NYT on El Chapo’s trial and verdict. Presiding Judge Cogan’s response to the El Chapo jury verdict. FRD’s 1936 speech announcing the Second New Deal, where he famously said, “I welcome their hatred.” Read his full remarks here. In this clip from the latest episode of the CAFE Insider podcast, Preet and his co-host Anne Milgram discuss whether American Media, Inc.’s threat to publish Jeff Bezos’ intimate texts and photos constitutes as extortion. Bezos’ hired investigator, Gavin De Becker, comments on AMI’s possible “political motive” to leak. The September 2018 non-prosecution agreement between American Media, Inc. (AMI) and SDNY. An interview on ABC’s “This Week” with Elkan Abramowitz, the attorney representing AMI CEO David Pecker. Transcript here. Jeffrey Toobin’s analysis in the New Yorker of Gawker’s collapse and its implications for the First Amendment. The Daily Beast article reporting that Michael Sanchez, the brother of Bezos’ mistress, Lauren Sanchez, gave the couple’s intimate texts to the National Enquirer. Preet and Anne also discuss Acting Attorney General Matthew Whitaker’s testimony before the House Judiciary Committee, the House Intelligence Committee’s new expansive investigation into Russia and Trump’s financial dealings, and a clue about “the Heart” of Mueller’s investigation revealed in Paul Manafort’s latest hearing. David Frum is a senior editor at the Atlantic, and author of nine books, most recentlyTrumpocracy: The Corruption of the American Republic. He served as a speechwriter and special assistant to the George W. Bush, and served as a senior adviser to Rudy Giuliani’s presidential campaign. Rep. Alexandria Ocasio-Cortez’s social media boot camp for the Democratic Caucus – read about it here. Do you have a question for Preet? Tweet it to @PreetBharara with the hashtag #askpreet, emailstaytuned@cafe.com, or call 699-247-7338 and leave a voicemail. In this clip of the CAFE Insider podcast, Preet and his co-host Anne Milgram discuss Roger Stone's arrest last week and the charges he faces from the Special Counsel's Office. In a clip from this week's episode of the CAFE Insider podcast, Preet and his co-host Anne Milgram discuss the New York Times bombshell story on Trump and Russia, and the FBI’s counterintelligence inquiry into whether Trump is a Russian asset. · Bill Barr’s confirmation hearings for Attorney General. · Whether the president can assert executive privilege to block portions of Mueller’s report. Ian Bremmer is the president and founder of Eurasia Group, a political risk analysis and consulting firm. He’s a foreign affairs columnist and editor-at-large at Time, and a global research professor at NYU. He’s written nine books, most recently Us vs. Them: The Failure of Globalism. Bremmer speaks with Preet about Eurasia's annual report anticipating the top risks facing the globe in 2019. Plus, Preet’s thoughts on Deputy Attorney General Rod Rosenstein’s plan to resign and the redaction fail in Manafort's defense memo. This interview was taped on 1/8/19. Adam Grant is an organizational psychologist and a professor at Wharton Business School. He’s a New York Times bestselling author three times over, and is the co-author of Option B with Sheryl Sandberg. In one of our favorite episodes of the year, from April 2018, Preet speaks with Adam about how to speak truth to power, what makes a good leader, and what advice he has for people in the West Wing. Kara Swisher is a technology journalist and co-founder and editor-at-large of Recode. She also hosts the Recode Decode podcast. She has been called “Silicon Valley’s most feared and well-liked journalist.” She speaks with Preet about Facebook and the many issues that have landed the company on the front pages. The conversation also ticks through the overall tech landscape, including Twitter, Google, and Amazon. Plus, Preet's thoughts on Michael Flynn's delayed sentencing and the case of the alleged Russian spy, Maria Butina. Michael Lewis is the author of fifteen books, including Moneyball and The Big Short. His new book, The Fifth Risk, takes on the Trump administration. He speaks with Preet about the dedication of the civil service, Trump’s attack on trust, and the dangers of willful ignorance. Plus, Preet’s take on Cohen’s three-year prison sentence. Comedian Kumail Nanjiani is the Oscar-nominated screenwriter of "The Big Sick," and stars in "Silicon Valley". He speaks with Preet about immigrating from Pakistan, getting political on Twitter, and who he’d play in a movie about the Trump administration. Preet and Anne Milgram make sense of Michael Cohen’s latest guilty plea, this time in the Mueller investigation. This episode was available to CAFE Insiders on Thursday. Become a member at cafe.com/insider. Chuck Todd is the host of Meet the Press and political director for NBC News. He spoke with Preet in front of a packed house in D.C. about the blue tornado of the midterms, being insulted by the President on twitter, and who should run in 2020. Michael Beschloss is a historian and the author of the new book, Presidents of War. He speaks with Preet about what the past can teach us about the Trump presidency, why history should matter to our leaders, and his wonderful, shade-filled twitter feed. Plus, Preet’s take on the legality of Whitaker as acting attorney general. David Axelrod, the chief strategist for both of Barack Obama's presidential campaigns, is the director of the University of Chicago's non-partisan Institute of Politics and the host of The Axe Files podcast. He talks to Preet about Tuesday's midterms, what taking the House will mean for the Democrats and for President Trump, and what we can learn from the campaign of Beto O'Rourke. Plus, Preet reacts to the forced resignation of Jeff Sessions. Jeffrey Toobin, a former prosecutor, is the chief legal analyst at CNN and a staff writer at the New Yorker. In front of a packed house at the Town Hall in New York, he speaks with Preet about Trump and the rule of law, Kavanaugh and the court, and why the Mueller investigation never leaks. Plus, Preet explains why an executive order can’t eliminate birthright citizenship. Fareed Zakaria is the host of Fareed Zakaria GPS on CNN, and a foreign affairs columnist for the Washington Post. He speaks with Preet about the apparent murder of journalist Jamal Khashoggi, who he has known for more than a decade. And, as Nikki Haley leaves the UN, they consider American isolationism and the Trump doctrine. Plus, what might happen if the Dems take the House. Max Boot was a senior policy advisor for three Republican presidential campaigns. He’s now a columnist at the Washington Post, and the author of The Corrosion of Conservatism: Why I Left the Right. He speaks with Preet about the future of our two-party system, how to make centrism cool, and the dangers of retweeting. Plus, Preet debunks the latest conspiracy theory - about him. Jane Mayer, Chief Washington Correspondent for the New Yorker, broke the story of Deborah Ramirez and her allegations against Brett Kavanaugh. She talks to Preet about the leads she’s still chasing, where the FBI should be looking, and how the Senate would vote if half its members were women. Plus, Preet’s take on the Trump tax investigation. Friday morning, Preet sat down with Anne Milgram, former Attorney General of New Jersey, to discuss Thursday's extraordinary testimony by Dr. Christine Blasey Ford and Brett Kavanaugh. This episode was recorded before Senator Jeff Flake announced he would only support Judge Kavanaugh's confirmation following an FBI investigation of Dr. Ford's claims. Nicolle Wallace is the host of "Deadline: White House" on MSNBC, and advised George W. Bush and John McCain. She talks with Preet about the chaos of the Kavanaugh nomination, what it means for the midterms, and compares Donald Trump and Sarah Palin. Plus, Preet assesses Rod Rosenstein's job security. Sally Jenkins writes about sports for the Washington Post. She talks with Preet about Serena Williams’s controversial U.S. Open final, the surprising history of the NFL, and the value of fairness on and off the field. Plus, Preet’s take on Brett Kavanaugh’s future. Ron Klain has worked on the confirmation or selection of eight Supreme Court Justices. He was chief of staff to Al Gore, Joe Biden, and Janet Reno, and Chief Counsel to the Senate Judiciary Committee. He talks to Preet about the Kavanaugh hearings, the missing documents, and what happens next. Plus, Preet explains the 25th Amendment. Jonathan Swan covers the White House for Axios. He talks with Preet about the latest leaks from the West Wing, how he separates facts from spin, and which of his high-powered sources uses Comic Sans. Plus, Preet dissects the implications of the President's latest attack on Attorney General Jeff Sessions. Cyrus Habib is the Lieutenant Governor of Washington State. He lost his eyesight to cancer at age 8, went on to Yale, and became the first Iranian-American to hold statewide office. He talks with Preet about his remarkable life, the midterms, and governing in a deeply divided America. Plus, Preet’s wish list for constitutional amendments. Joyce Vance was the U.S. Attorney for the Northern District of Alabama during the Obama Administration. She joins Preet to talk through the guilty plea of Donald Trump's former personal lawyer, Michael Cohen, and the conviction of his former campaign chair, Paul Manafort. John Carreyrou is the author of Bad Blood, a book about the rise and fall of healthcare startup Theranos. For year, Theranos and its founder, Elizabeth Holmes, conned investors and customers with the promise of a new blood testing technology. Carreyrou's reporting helped expose fraud at the company. John talks to Preet about how people like General James Mattis got pulled into the Theranos orbit, and his own reporting drama around the story. Also this week, Preet answers your questions about the secret Omarosa tapes and the dramatic Paul Manfort trial. Steve Schmidt was a top Republican strategist - until he left the party this June. He joins Preet to talk about Trump's appeal, the silence of Congressional Republicans, and what's next for principled conservatives. Plus, Preet's thoughts on the fireworks at the Paul Manafort trial. In this special bonus episode, Preet and Katie Couric interview each other. Katie gets Preet's thoughts on Comey, Cuomo, and 2020. Then Preet asks Katie about the future of CBS president Les Moonves and her experience broadcasting live on September 11, 2001. Preet is back Thursday with a regular episode of Stay Tuned, and your questions. Bill Browder is a campaigner for justice in Russia. In Helsinki, Vladimir Putin asked for Bill to be handed over to the Russian government - a request that President Trump called "an incredible offer." Bill is back to talk about what’s changed for him, for America and for the world. The first season of CAFE’s newest podcast, ReMade in America, wraps up this week. Here’s one last highlight for Stay Tuned listeners: host Bassem Youssef’s conversation with comedian Cameron Esposito. And the final episode of ReMade is out today, featuring HBO Documentaries legend Sheila Nevins and New York Times columnist Nick Kristof. You can listen to it on their show page. Preet will be back Thursday with a new episode of Stay Tuned. Jeremy Bash was Chief of Staff at the CIA and the Department of Defense under President Obama. He joins Preet to discuss the Helsinki Summit, Mueller’s indictment of 12 Russian intelligence operatives and what leverage Putin might have over President Trump. Plus, an update on Preet’s plan for the New York Attorney General race. Nina Totenberg is NPR’s legendary Supreme Court reporter. She speaks with Preet about breaking the Anita Hill story, pot-smoking justices, and the confirmation prospects for Judge Brett Kavanaugh. Plus, Preet’s thoughts on Trump, Putin and Helsinski. This week, Preet is a special guest on CAFE's other hit podcast, Remade In America, hosted by comedian Bassem Youssef. Here's a sneak preview. Bassem was known as the Jon Stewart of Egypt. Now, he's living in exile and finding his footing in a new country. ReMade in America is a show about feeling like an outsider in America — and trying to make it anyway. Vanita Gupta is president of the Leadership Conference on Civil and Human Rights, and worked in the Obama Administration. She joins Preet to discuss the nomination of Brett Kavanaugh to the Supreme Court, and what’s at stake. Plus, an update on family separations at the Southern border and Preet’s thoughts on Michael Cohen’s media strategy. Garry Kasparov is the greatest chess player of all time, and one of Vladimir Putin's most vocal critics. He joins Preet to discuss Russian misinformation and attacks on the concept of truth, in this re-aired interview. Plus, Preet gives his take on the legal crisis at the Southern border, in an all-new QA. There’s a new podcast in the Cafe family: ReMade in America, hosted by comedian Bassem Youssef. In this episode, Bassem speaks with journalist Maria Hinojosa, host of NPR’s Latino USA, about her own immigration journey, diversity in journalism, and how she is navigating the era of fake news. ReMade in America is a show about feeling like an outsider in America — and trying to make it anyway. Check it out, subscribe, and Preet will be back Thursday to answer your questions. Anne Milgram is the former Attorney General of New Jersey. Lisa Monaco was the Homeland Security Advisor to President Barack Obama. They join Preet to tackle your questions on the criminal justice system. What does collusion mean? What is a constitutional crisis? And is court anything like how it seems on TV? Jason Goldfarb is a former lawyer who was prosecuted for insider trading by Preet’s old office, the Southern District of New York. Goldfarb joins Preet to talk about the experience of being prosecuted, pleading guilty, and building a life after prison. This is the third episode in our series on the roles and players in the criminal justice system. Plus, Preet’s thoughts on flipping, pardons and Manafort. Pat Fitzgerald is a former federal prosecutor. He led cases against Governor Rod Blagojevich, Al Qaeda terrorists, and the mob. Today he’s a private citizen and representing Jim Comey, among others. He speaks with Preet about how to build a case, the art of flipping a witness, and deciphering wiretaps in pig latin. This is the second episode in our series on the roles and players in the criminal justice system. Plus, Preet gives his thoughts on presidential pardons and when it matters to know all the the words to a song. You heard him a few weeks ago live on stage with Preet at the Apollo Theater. Now Bassem Youssef has his own podcast: Remade in America. It's a show about feeling like an outsider in America — and trying to make it anyway. This first episode features comedian Maz Jobrani, author of "I’m Not a Terrorist, But I’ve Played One On TV." And the second episode of Remade in America, just out today, features the hilarious and insightful Baratunde Thurston. Check it out, subscribe and Preet will be back Thursday with a new episode of Stay Tuned. Ben Brafman is one of America’s most prominent defense attorneys. He has represented Sean Combs, Martin Shkreli, and Harvey Weinstein. Brafman speaks with Preet about the clients he won’t take on, why everyone deserves a good lawyer, and what it’s like to represent someone everyone hates. This is the first episode in our series on the roles and players in the criminal justice system. Plus, Preet answers your questions about the latest developments in the case against Michael Cohen. Doug Jones is a Democratic Senator from Alabama. He talks with Preet about what it takes to turn red states blue, prosecuting civil rights cold cases as U.S. attorney, and how he makes decisions on contentious votes—like the recent Haspel and Pompeo nominations. Plus, Preet breaks down the president’s call for an investigation into the Department of Justice. Sherrilyn Ifill is the president of the NAACP Legal Defense and Education Fund. She talks with Preet about about the rise of artificial intelligence in policing, how both companies and law enforcement can confront issues of racial bias, and the attack on voting rights in America. Plus, in the wake of this week’s primaries, Preet weighs in on what might happen if Democrats take the House this fall. Before the Egyptian revolution, Bassem Youssef was a heart surgeon who moonlighted as a political comedian. He went on to become the Jon Stewart of Egypt, poking fun at the regime with an audience of 40 million people. Then he was forced to flee the country. Preet spoke with Bassem live on stage at the Apollo Theater about his journey from doctor to comedian to, now, podcast host in America. Bassem's show, "Remade in America," launches later this month. Plus: Preet reflects on the accusations against former New York Attorney General Eric Schneiderman — and what might happen next for himself. Bill Browder is a British hedge fund manager and a vocal critic of Vladimir Putin. Since his friend Sergei Magnitsky was killed in a Russian prison, Browder has led an international campaign to punish his killers — some of the most powerful people in Russia. Not by bringing them to trial, but by restricting their travel and cash flow. Browder speaks with Preet about the dangers of Putin and his own quest for justice. Preet's riveting conversation with Bill Browder first aired in October. Ronan Farrow is an author and journalist who just won the Pulitzer Prize for his reporting on Harvey Weinstein. He’s also the author of a new book, The War on Peace: The End of Diplomacy and the Decline of American Influence. He speaks with Preet about the prospect of a Secretary of State Pompeo, and why the gutting of the diplomatic corps should worry us all. And, they talk about Farrow's groundbreaking reporting on the Me Too movement, and the influence of his mother, Mia Farrow. Plus, Preet explains what Rudy Giuliani’s connections can and can’t do for President Trump. Do you have a question for Preet? Tweet them to @PreetBharara with the hashtag #askpreet , email staytuned@cafe.com, or call 669-247-7338 and leave a voicemail. Adam Grant is an organizational psychologist and a professor at the Wharton School. He’s a New York Times bestselling author three times over, and is the co-author of Option B with Sheryl Sandberg. His books, and his work, focus on how to cultivate success in an organization, and how people can push back against groupthink. He talks to Preet about how to speak truth to power, what makes a good leader, and what advice he has for people in the West Wing. Plus, Preet explains whether only clients get attorney-client privilege. Jeh Johnson ran the Department of Homeland Security Security under President Obama. Johnson previously served as general counsel for the Department of Defense and is also an alum of the Southern District of New York, where he was Assistant U.S. Attorney. He speaks with Preet about border security, his role as the very first person to resign from the Trump administration, and what it means when elected officials don’t trust our intelligence agencies. Plus: Preet sorts fact from rampant speculation around the FBI raid of Michael Cohen. Do you have a question for Preet? Tweet them to @PreetBharara, email staytuned@cafe.com, or call 669-247-7338 and leave a voicemail. Michael McFaul served as U.S. Ambassador to Russia during Barack Obama's second term. He speaks with Preet about what Vladimir Putin is like in real life and how it felt to live under constant surveillance in Moscow. McFaul is the author of the upcoming book "From Cold War to Hot Peace." Plus, Preet tries to untangle Donald Trump's attacks on Amazon and Jeff Bezos. Do you have a question for Preet? Tweet them to @PreetBharara, email staytuned@cafe.com, or call 669-247-7338 and leave a voicemail. This week we take an inside look at the opioid crisis. Preet speaks with parent advocate Susan Salomone and Dr. Abigail Herron about the deepening public health crisis and what can be done to solve it. Plus: why can’t President Trump retain any good lawyers? Do you have a question for Preet? Tweet them to @PreetBharara, email staytuned@cafe.com, or call 669-247-7338 and leave a voicemail. Chuck Rosenberg has done some of the most important jobs in law enforcement, from United States attorney to acting head of the Drug Enforcement Administration, a job he resigned from last fall. He talks to Preet about why he quit, the opioid crisis, and how to try a terrorist. Plus: Preet answers your questions about Andrew McCabe and what’s next for the special counsel. Do you have a question for Preet? Tweet them to @PreetBharara, email staytuned@cafe.com, or call 669-247-7338 and leave a voicemail. Jimmy O'Neill is the commissioner of the NYPD. He talks to Preet about his thirty-year career in the police force, how the cops deal with modern challenges like terror threats, violence in schools, and building trust in the community. Plus: Preet answers your questions about the latest with Robert Mueller and Stormy Daniels. Do you have a question for Preet? Tweet them to @PreetBharara, email staytuned@cafe.com, or call 669-247-7338 and leave a voicemail. Adam Schiff is the ranking Democrat on the House Intelligence Committee. He talks about the notorious Nunes memo, and the Democratic response he helped draft. He also gives some advice for how Democrats should position themselves for the upcoming midterm elections. (Hint: don't focus on Russia) Do you have a question for Preet? Tweet them to @PreetBharara, email staytuned@cafe.com, or call 669-247-7338 and leave a voicemail. Shannon Watts is the founder of Moms Demand Action, a group dedicated to address gun violence in America. She sits down with Preet to discuss what can be done in wake of the attack at Marjory Stoneman Douglas High School. Do you have a question for Preet? Tweet them to @PreetBharara, email staytuned@cafe.com, or call 669-247-7338 and leave a voicemail. Christine Todd Whitman is the former governor of New Jersey and the EPA Administrator under George W. Bush. Now she's co-chairing the Democracy Taskforce with Preet. They discuss what it's like to disagree with the President while you're in cabinet and the struggle of being a moderate Republican in 2018. Do you have a question for Preet? Tweet them to @PreetBharara, email staytuned@cafe.com, or call 669-247-7338 and leave a voicemail. David Cole is the legal director of the American Civil Liberties Union. Cole and Preet discuss the ACLU’s role during the Trump Administration, including their lawsuit against the travel ban, their ongoing fight for digital privacy, and whether Cole considers the ACLU as part of “the resistance.” Plus: Preet answers your questions about how security clearances really work. Do you have a question for Preet? Tweet them to @PreetBharara, email staytuned@cafe.com, or call 669-247-7338 and leave a voicemail. Sheldon Whitehouse is a Democratic Senator from Rhode Island and a long-time member of the judiciary committee. He sits down with Preet to discuss the Nunes memo, the Mueller investigation, and the circus that is Washington D.C. Do you have a question for Preet? Tweet them to @PreetBharara or call 669-247-7338 and leave a voicemail. Floyd Abrams is America's most prominent First Amendment attorney. He's defended cases from the Pentagon Papers to Citizens United. Abrams talks with Preet about his long career and how Trump is different from every other president when it comes to free speech. Do you have a question for Preet? Tweet them to @PreetBharara or call 669-247-7338 and leave a voicemail. In her new book, “Unbelievable,” Katy Tur dives into the deeply unglamorous life of covering the 2016 presidential election, from very early mornings to being spit at by voters. Tur broke several important stories while covering the Trump campaign, and now works as a correspondent at NBC News, and a host at MSNBC. She discusses access journalism, and the subtle art of covering the news in the President's favourite medium. Do you have a question for Preet? Tweet them to @PreetBharara or call 669-247-7338 and leave a voicemail. Preet talks with Oscar-winning documentarian Alex Gibney. He’s made films about the Enron scandal, Eliot Spitzer, Lance Armstrong, and the Church of Scientology. His new Netflix series examines corporate crimes. It’s called “Dirty Money.” Do you have a question for Preet? Tweet them to @PreetBharara or call 669-247-7338 and leave a voicemail. Anne Milgram, the former Attorney General of New Jersey, returns to help answer your questions about the Mueller investigation. Will anyone else be indicted? How long is this going to take? And did Jeff Sessions really try to find 'dirt' on James Comey? Do you have a question for Preet? Tweet them to @PreetBharara or call 669-247-7338 and leave a voicemail. Preet sits down with Tina Brown, former editor of The New Yorker and Vanity Fair, to talk about working with Harvey Weinstein, what will happen next with the #metoo movement, and her new book about her life in 1980s New York. Plus: Preet answers your questions about Trump and Rod Rosenstein. Do you have a question for Preet? Tweet them to @PreetBharara or call 669-247-7338 and leave a voicemail. Our first live show! Preet answers questions from the audience, including his thoughts on the latest with Robert Mueller and whether life as a podcaster is more or less fulfilling than life as a federal prosecutor. (Spoiler: it's not.) Then he talks with The Daily Show's Hasan Minhaj about hosting the White House Correspondents Dinner, his Netflix special, and making it in show business as a Muslim-American. Plus: a special guest appearance by someone very close to Preet. Do you have a question for Preet? Tweet them to @PreetBharara or call 669-247-7338 and leave a voicemail. Garry Kasparov is perhaps the greatest chess player of all time. But today, he dedicates his life to human rights and fighting Russian President Vladimir Putin from exile. Kasparov talks about the Kremlin's massive misinformation campaign, and what he thinks happened when Michael Flynn met with Russian diplomats. Plus, more questions about the Mueller investigation, answered. Do you have a question for Preet? Tweet them to @PreetBharara or call 669-247-7338 and leave a voicemail. In a special episode, Preet breaks down the implications of Michael Flynn's guilty plea last week. There are three possible reasons Flynn would cut a deal with Special Counsel Robert Muller, and Preet explains what each one would mean for the investigation. Plus: a response to the President's claim that the FBI is "in tatters." Do you have a question for Preet? Tweet them to @PreetBharara or call 669-247-7338 and leave a voicemail. How does a group of former White House staffers make politics accessible for a new generation? Preet talks with Pod Save America’s Jon Favreau, Jon Lovett, and Tommy Vietor about their very popular show and how to persuade young voters in a deeply partisan age. Do you have a question for Preet? Tweet them to @PreetBharara or call 669-247-7338 and leave a voicemail. What does it feel like to send someone to jail? Is the death penalty unconstitutional? Should judges ever be funny in the courtroom? Preet sits down with Judge Jed Rakoff (United States District Court for the Southern District of New York) for a conversation about the emotional and intellectual challenges of being a federal judge. Do you have a question for Preet? Tweet them to @PreetBharara or call 669-247-7338 and leave a voicemail. Amidst hundreds of ongoing accusations of sexual assault and harassment in the film and comedy industries, Preet sat down with writer/director/producer Judd Apatow (Knocked Up, The 40 Year-Old Virgin, HBO’s Girls) in his Los Angeles office to talk through the culture of silence that pervades Hollywood. In addition to talking about Harvey Weinstein, Louis C.K., and Woody Allen, they discuss Donald Trump and the dangers of a president who never seems to laugh. Do you have a question for Preet? Tweet them to @PreetBharara or call 669-247-7338 and leave a voicemail. Senator Jeff Flake, a Republican from Arizona, recently announced his decision not to run for reelection in 2018, in a speech that rebuked the state of the Republican party and the leadership provided by President Trump. In this wide-ranging conversation with Preet, the senator explained his decision not to run, lamented how much power the NRA holds over congress, and argued for the role of decency in contemporary politics. Do you have a question for Preet? Tweet them to @PreetBharara or call 669-247-7338 and leave a voicemail. Three days after Robert Mueller's charges against members of the Trump campaign were revealed, Preet talks with Anne Milgram, who has worked closely with Mueller and his investigators as a former Attorney General for the state of New Jersey and federal prosecutor. Together they explain in detail how a massive investigation like Mueller's works, and they make their most educated guesses as to what might happen next and who might be targeted. Do you have a question for Preet? Tweet them to @PreetBharara or call 669-247-7338 and leave a voicemail. In a special episode, Preet responds to today’s news of the indictments of two Trump campaign officials and, more importantly, the guilty plea — and cooperation — obtained from another. He parses what’s in the documents that were unsealed, explains what we now know, and considers what’s likely to come next in Robert Mueller’s ongoing investigation. Days after Vladimir Putin got Bill Browder's US visa revoked and his name placed on Interpol's international watch list, Preet reaches Browder at his office in London. They discuss the massive corruption Browder revealed that led to his lawyer, Sergei Magnitsky, being tortured and dying in a Russian prison; Putin's influence in America and the structures that can resist him; and Browder's ongoing battle with the man who, as he puts it, "wants to destroy me." Do you have a question for Preet? Tweet them to @PreetBharara or call 669-247-7338 and leave a voicemail. Catherine Hoke, Founder and CEO of Defy Ventures, joins Preet for a conversation about the challenges that incarcerated people face when reentering society, the businesses that formerly incarcerated folks have started through her program, and the Shark Tank-like process that gets them there. As the news from the mass shooting in Las Vegas was rolling in Monday morning, Preet sat down with John Miller, Deputy Commissioner of Intelligence & Counter-terrorism of the NYPD as well as a Peabody and Emmy Award-winning journalist. They discuss the role that police can play in advocating for smarter gun laws, how the NYPD responds to mass shootings, and the stories behind Miller's historic interviews with John Gotti and Osama Bin Laden. Preet talks to his old friend Lisa Monaco, who was chief of staff for now-Special Counsel Robert Mueller at the FBI before serving as President Obama’s Advisor on Homeland Security and Counterterrorism. They discuss how Mueller is approaching the investigation, what she learned from Obama, and the hardest thing she ever had to do at the White House. What is life like in the Department of Justice under Jeff Sessions? And what does the Trump Administration mean for civil rights in America? Preet talks to his old friend Vanita Gupta, who led the Justice Department's Civil Rights Division under President Obama, about why justice officials are staying, why they’re leaving, and what to make of the NFL controversy. On March 11, 2017 President Donald Trump fired US Attorney Preet Bharara. Preet tells the story in detail for the first time. Then, a conversation with former Secretary of Defense and former CIA Director Leon Panetta about how to clean up a chaotic White House, trade Russian spies, and stand up for what’s right, even if it means defying a president. Join Preet Bharara, the former U.S. Attorney who fought corruption, financial fraud and violent crime, in a series about justice and fairness. Coming Wednesday, September 20th.